-Frank Palmero, Plumbing Service Mgr. Lindstrom Plumbing Complete Drain Care and Plumbing Treatment has a seven-strain bacteria formula and uses the natural process of biological decomposition that has kept our environment in perfect equilibrium since the beginning of time. Its nature's way of recycling and renewing itself, through a steady decomposition of organic waste matter and its conversion to simple, essential substances. This ongoing process is the work of trillions of tiny, naturally occurring, living microorganisms that use organic waste as their food and energy source. 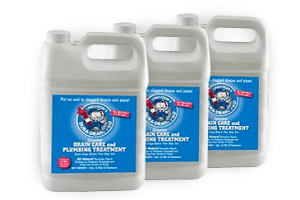 Lindstrom Plumbing Complete Drain Care and Plumbing Treatment harnesses this natural process to meet today's need for cleaning drains, without the use of potentially harmful chemicals. With a fresh lemon scent, Lindstrom Plumbing Complete Drain Care and Plumbing Treatment can be used for slow running and clogged drains, septic systems, recreation vehicles, portable toilets, dog runs, garbage cans and more.